Great for the small breeds dogs and for cats up to 25 lbs. 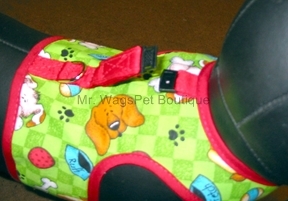 These walking harnesses are made of decorative lightweight cotton fabrics. They velcro in the front and under the belly and are fully adjustable. 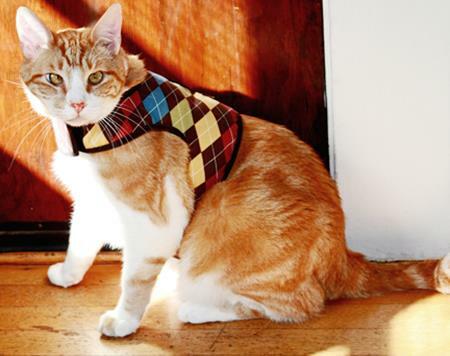 These harnesses are designed to relieve pressure from your pet’s throat. They do not choke or bind. Reinforced Grosgrain holds D-Ring securely. Our Velcro is commercial grade and therefore, extremely strong. Fabrics: Click on the Image Gallery to see some of our available fabrics. Make sure to check back often as we update with new fabrics as they become available. Or call us if you prefer for our extensive collection of fabrics. We love buying new fabrics and do it frequently. You’ll find your customers will come in often to see what new fabrics you have in stock. Regular - is the standard harness that is in most of our photos. with no lace or fabric below the waist. Fancy - Has lace around the edge of the harness. 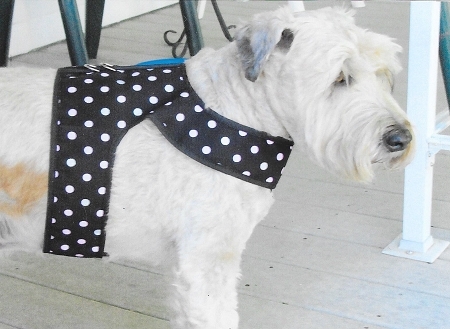 Mini Skirt - (for short backed dogs) Has a short cloth edge below the waist along with lace. 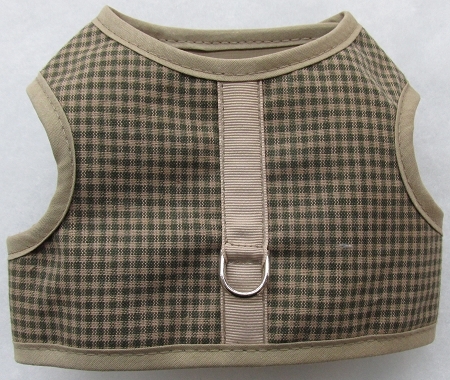 Dress - (for longer backed dogs) Has more material below the waist giving the appearance of Fancy,Laced dress. A Walking Harness and a Car Safety Belt Harness all-in-one!! This harness is made to be used in a car seat. 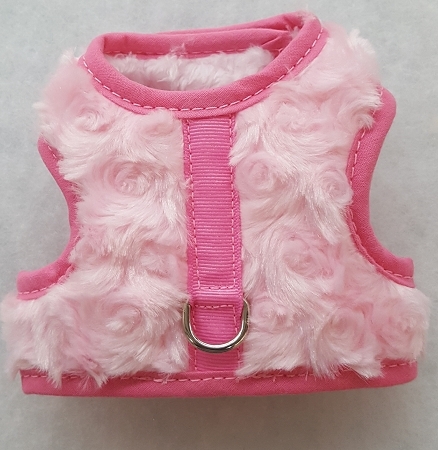 The harness has a wider waist band and a quick release flap to accommodate the seat belt You can attach your pet in the car seat with just the lap belt part of the seat belt. There is a quick release snap on the harness that allows you to place your pet in the seat, bring the seat belt across and fasten it in place. Then quick release the snap on the harness and lap it over the lap part of the seat belt Then fasten the quick release. Your pet will be secure in the care seat with some mobility but yet secure. These harnesses are also usable in everyday walking. 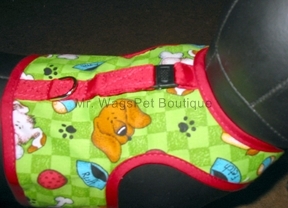 Measures the same as the regular walking harness and also available in the same fabrics. To order your Car Safety Belt Harness just select the yes button above. My 16 lb large Rag Doll Cat fits perfectly comfortable in his New Blue Walking harnest that matches his eyes!!! Now we can resume our walking on the San Antonio River Walk with his Smaller brother who by the way enjoys his harnest too!!! I love this harness. My dog has been wearing on for 10 yrs. It's a little faded but held up well. Other harnesses I've bought only last a few months. I recently purchased two harnesses. 1 that was blue plaid with blue piping and one that was pink plaid with pink piping. Both were very well made and look adorable on my two maltese. I have been purchasing I have not found any other harnesses that fit so well and function as well with the leash hook on the back. I put them on my dogs every day. They each have about 5 different outfits and they enjoy them as much. It makes it so easy to pick them up with out hurting them or straining them. Love these harnesses. This one was a gift, but I have purchased others for my dog. The person who received the harness said she loved it. I would not put anything else on my dog! This is a great product. Would highly recommend it.